Chelsea Defender linked with move away after return of Nathan Ake? 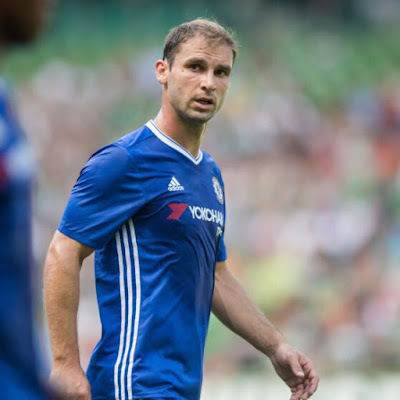 Branislav Ivanovic is being linked with a move away from Chelsea before the close of the transfer window with the likes of Everton and West Brom reportedly looking to make their move. Ivanovic like a couple of others has fallen foul of the tactical switch made by Antonio Conte to a back three and adopting two out and out wing-backs. As we have seen throughout the course of the season since the switch was made, Victor Moses is the obvious first choice for Conte and has featured in every single game. With the additional return of Nathan Ake to Chelsea we have to wonder what the future holds for the 32-year-old. Coupled with the return of Nathan Ake has been the return from injury of Kurt Zouma who sits waiting in the wings to show the manager what he could offer him if he gets a chance in the side. Let's also not forget John Terry who is another waiting for his chance. Based on those three players waiting for their chance and training hard trying to impress the manager, you have to believe that the Serbian defender, who has been an absolute stalwart for our club over the years, is now struggling to get himself into the plans of Conte who has taken Chelsea to the top of the Premier League eight points clear of our rivals. As with anything in life, time moves on and cares for no-one. Managers and players come and go and that's just what happens and it's sad to see someone who has given so much to the club struggle to get back into contention. As I said, if he does leave the club this month there will be plenty to be written about Branislav Ivanovic for what he has given to our club over the years. Looking at the situation as it is now, it's difficult to see nothing happening with this rumour in the next week or so. I would expect being given the opportunity to stay in the Premier League, with a deal at Chelsea until the end of the season, that Ivanovic will leave us. What do you think? Do you agree ?